Warren Buffett is stock guru and most successful investor of 20th century. Today warren buffett is 3rd richest person of the world, yet he lives simple life without any luxury. Warren buffett converted dying textile mill “Berkshire Hathaway” to successful finance holding company. He is true inspiration for youth. So here is 21 amazing facts about Warren Buffett. Warren Buffett made first investment when he was only 11 years old & he feels that he has started late. Compare to warren buffett we don’t start investment at age of 21 year forget 11 year. Buffett started earning money at age of 6 year. He was selling pack of chewing gum. Buffett filled his first income tax return at 13 year to claim 35$. Many of us don’t know about income tax at age of 13 year. Buffett purchased small farm at the age of 14 years. He made enough saving by delivering newspaper. 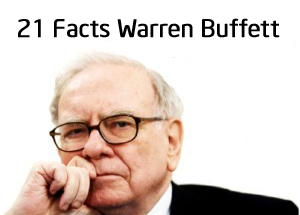 Warren Buffett was rejected by Havard Business School despite of his knowledge about stock market. Buffett converted Berkshire Hathaway in successful finance holding company. Today Berkshire Hathaway owns 63 companies. Warren Buffett given only two rules to CEO of these companies. Rule number 1: Do not lose any of your shareholder’s money. Rule number 2: Do not forget rule number 1. Buffett believes in simple living high thinking he does not carry even mobile with him. Buffett does not like to socialize with the high society crowd. Warren Buffett still lives in old home purchased half century ago. Warren Buffett drives his car on his own at age of 83 years. Warren Buffett decided to donate 85% of his wealth as charity. Warren Buffett hold private jet company but he never travel by private jet. Warren Buffett believes in Long term Investment strategy. He is investor and not trader. Warren Buffett net worth today is $63.3 billon which is greater than combine GDP of Ghana and Combodia for 2013. Warren Buffett made on and average $37 million per day in 2013. If we divide it further he made $1.5 million per hour in 2013. Singapore based man bid $2.2 million in 2014 just to have lunch with Buffett. Berkshire Hathaway’s cash balance is at $50 billion enough to purchase 45 Airbus A318s. If you invested $1,000 in Berkshire Hathaway in 1970, that amount would be $4.86 million today. Buffett has so far donated enough money in his lifetime to build four Apple “Spaceship” Campuses.